Whether or not you have a garden, this minestrone soup is the perfect soup for a cold winter’s afternoon. For added protein, toss in leftover beef or chicken. 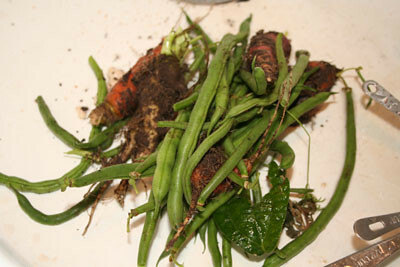 Yesterday, since I was making Minestrone soup for dinner, I decided to check the garden for carrots. To my surprise I found the bean plants still alive and kicking, and producing fresh beans. I picked about one pound and used them in the Minestrone along with the few carrots I found. The tomatoes in the soup I froze this summer, and the potatoes were dug up in August. When making the soup, I used a very full gallon freezer bag of plum tomatoes. Before putting them in the pot, I defrosted the bag, and drained the liquid. Instead of using water, I used vegetable broth which I made last week. I skipped the 15 ounce can of cannellini beans since I had none, and I also skipped the white wine since we don’t use alcohol. My last change was to omit the radicchio and substitute dried kale. Saute onion, carrots, and celery in olive oil for about 5 minutes. 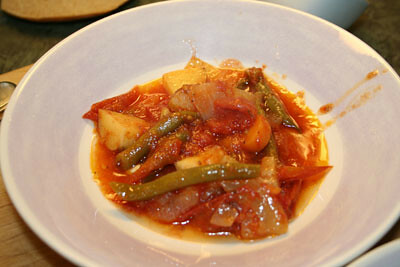 Add the tomatoes and beans and continue sauteing for 20 minutes. Add water and bring the mixture to a boil. Add in the rest of the ingredients, and cover the pot. Bring to a boil, and simmer for 60 minutes. Turn off the heat, and let the soup stand on a cool burner for 15 minutes. Remove the bay leaf before serving. Minestrone soup is probably my all time favorite soup. I love the taste, but I also appreciate that it is a great way to use up veggies from the garden. I hope your son feels better soon! Thank you for sharing your recipes with the Hearth and Soul Hop. Your Soup looks delicious. Thanks for sharing and hope you are having a wonderful week! So glad you mentioned that you supplemented kale for radicchio, as I am not a fan of radicchio. Now I can be certain it will work well without it. Yes, I’m all for using what you have! Hope you are feeling well. Thanks for sharing this beautiful minestrone soup to hearth and soul blog hop. Thanks! I’m feeling better, but my ds6 has viral bronchitis and the beginning of an ear infection. He and it sounds bad, but he’ll be better soon. What a lovely soup, and how wonderful you could use so many home grown ingredients in it! Thank you for sharing this post with the Hearth and Soul hop. I know it makes no sense but it just never dawned on me to make minestrone instead of buying it in a can. Considering I make everything else from scratch we have just been avoid it. Going to have to pin this so I can make it when life calms down. It’s funny how there are some things we never think of making! I love minestrone because you can tailor to your family’s likes. Sometimes I’ll make it with sausage, sometimes with pasta.